Operation Tumbler–Snapper was a series of atomic tests conducted by the United States in early 1952 at the Nevada Test Site. The Tumbler-Snapper series of tests followed Operation Buster-Jangle, and preceded Operation Ivy. 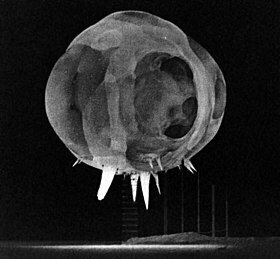 The Tumbler phase, sponsored by the Atomic Energy Commission consisted of three airdrops which were intended to help explain discrepancies in the actual and estimated blast shock wave damage noted on previous detonations, and to establish more accurately the optimum height of burst. The Snapper phase, sponsored by the Department of Defense consisted of one airdrop and four tower shots intended to test various new weapons developments. The military exercise Desert Rock IV, involving 7350 soldiers, took place during the test series. They trained during the Charlie, Dog, and George shots and observed shot Fox. weapon effect Mk-4 1 kt I-131 venting detected, 140 kCi (5,200 TBq)  U-235 core, same as Ranger/Able. weapons development Mk-4 31 kt I-131 venting detected, 4.6 MCi (170 PBq)  Proof test of new core (?). First blast broadcast live on TV. Desert Rock IV. weapons development TX-7 19 kt I-131 venting detected, 2.9 MCi (110 PBq)  Tested deuterium (without tritium) gas fusion boosting. Investigate rope trick. Desert Rock IV. weapons development Mk-12 "BROK-1" 12 kt I-131 venting detected, 1.8 MCi (67 PBq)  First use of beryllium as tamper. weapons development TX-5 "XR1" 11 kt I-131 venting detected, 1.6 MCi (59 PBq)  Designed to test the initiation/yield curve. Calibration test for TOM polonium/beryllium internal initiator. Desert Rock IV. weapons development TX-5 "XR-2" 15 kt I-131 venting detected, 2.2 MCi (81 PBq)  Tested an external betatron initiator that shot x-rays into the core, which induced neutrons by photofission. Desert Rock IV. weapons development TX-12 "Scorpion" 14 kt I-131 venting detected, 2.1 MCi (78 PBq)  First test to use a beryllium neutron reflector/tamper. A clip of a mushroom cloud during Operation Tumbler-Snapper. Background color change is photographic artifact; vertical smoke trails allow for making shock wave visible. Wikimedia Commons has media related to Operation Tumbler-Snapper. ^ Byrnes, V. A. (1953). Flash blindness. Operation SNAPPER. Nevada Proving Grounds, April-June 1952, Project 4.5. School of Aerospace Medicine. Brooks A.F.B. Texas. ^ "Operation TUMBLER SNAPPER Fact Sheet" (PDF). Defense Threat Reduction Agency. Archived from the original (PDF) on February 18, 2013. Retrieved October 26, 2013. Robert Standish Norris and Thomas B. Cochran. "United States Nuclear Tests July 1945 to 31 December 1992" (PDF). NRDC NWD 94-1. Archived from the original (PDF) on September 27, 2014. Retrieved November 12, 2007. "Troops shown three miles from 'ground zero' of bomb"